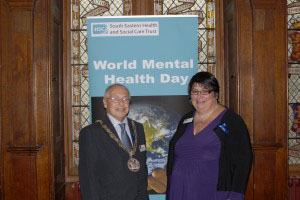 Bangor Town Hall was the venue for an event to celebrate World Mental Health Day. Twenty community groups including AMH, were represented in a session with health trust workers, councillors and council officers. South Eastern Trust mental health officer, Fiona Molloy gave a lesson in depression and explained the stigma of a condition that affects one in four people. The Council also marked the day with a floral display at the roundabout in Main Street.